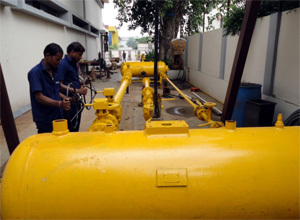 Hydro-pneumatic Testing Up to 50,000 PSI or as per your Requirement. Booster pump (intensifier): To test pneumatic pressure of valves up to 10,000 PSI or as per your requirement. 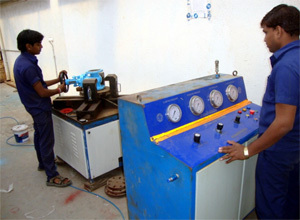 Pneumatic testing Machine: To test any valve up to 2250 PSI or as per your requirement. Air Compressor : To test any fitting or valve pneumatically up to 10 kg pressure or as per your requirement. The most widely used test specification in the world today. The document covers all types of valves in sizes through NPS 24. 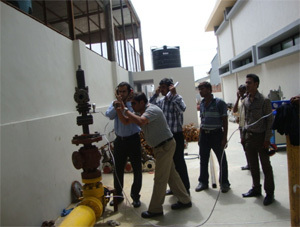 It also includes leakage rates and testing criteria for metal-seated and resilient-seated valves. This document covers the seat tightness of pressure relief valves. It also includes allowable leakage rates for testing with steam, water and air. The primary valve design document, it also contains charts for determining the working pressures of valves to be used in conjunction with other test standards, such as API 598. B16.34 contains a test procedure, but no seat leakage acceptance criteria. This document contains detailed test procedures and leakage rate classes for control valves. The leakage classes are also occasionally referenced by other documents and used as acceptance criteria. 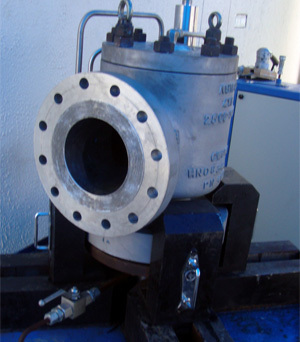 It provides a procedure for the hydrostatic shell testing of control valves. Closure testing and acceptance criteria are out of the scope of this document and usually are covered by referencing FCI 70-2.